Even on their briefest journeys, like the one meter or so excursions of fiddler crabs on their grazing trips away from their burrows, animals need to keep track of two kinds of information, if they are to eventually return home: their compass bearing and the distances they travel. This becomes even more important on longer forays, like the 600 m foraging excursions of desert ants or the many kilometres bees often cover when collecting nectar or water. The compass cues that are available on Earth depend on the scale at which animals move - a distant tree may suffice as a beacon for journeys of a few meters, a distant mountain can serve to provide compass direction for excursions of a few hundred meters, but movements beyond such 'suburban' distances require compass information that is reliable and does not change over large distances of travel. The Earth's magnetic field direction offers one such invariant cue, the celestial bodies Sun, Moon, and stars, by virtue of their comparatively infinite distance, the other. The problem with celestial compass cues is that they change position as the Earth rotates, and in order to use them for journeys that last longer than a few minutes, their movements need to be taken into account. So, as far as compass cues are concerned, there are two kinds: cues that are static in relation to the world and those that are dynamic, but predictable. The static compass cues, in order of the scale over which they provide useful information, are landmark beacons, large oriented terrain features like edges of vegetation, mountain ranges, coastlines, and roads, and of course the polarity of the Earth's magnetic field. The dynamic compass cues are all celestial: the Sun, the Moon, the stars, the pattern of polarized skylight, and the distribution and spectral composition of skylight (Figures 2a and 2b). Practically all mobile animals are known to use one or a combination of these cues, when maintaining a straight course, and those that derive compass information from the dynamic celestial cues do know about their movement across the sky. 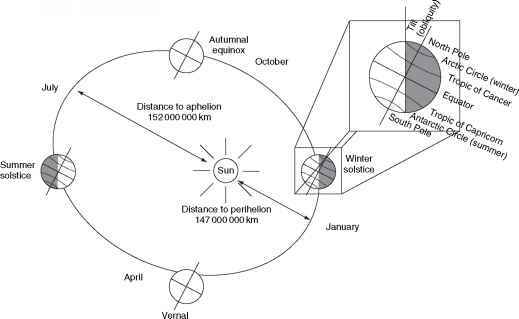 Bees, for instance, when communicating in the darkness of their hive to their nest mates the direction of a food source, can predict where the Sun ought to be at that particular time of day and indicate the compass bearing of the food source relative to the Sun. When traveling, animals need, in addition to a compass, a way of measuring the distances they have moved. There is no direct way, in which this can be done, but animals could use a number of indirect measures of distance traveled: they could measure time, their energy consumption, they could count their steps, their fin or wing beats, or they could monitor the optic flow they experience, that is how much of the world has whizzed past their eyes. For insects, it is only in the last decade or so, that the sensory basis of odometry has been identified: bees integrate the image motion they experience during their foraging trips in order to judge (and communicate) the distance they have flown (Figure 2c); desert ants employ a step counter, which interestingly discards information on the three-dimensional topography of the ground they walk over, by only registering the horizontal component of the distance covered (Figure 2d). Migrating birds, in turn, appear to come with instructions about how far to fly, that are based on the energy they would require to cover certain distances.